Why are we as a society so obsessed with crime? Our fascination with murder in particular has led to the writing of countless volumes of books which have further stoked the insatiable need to know as much as possible about these heinous acts as possible. Is there a link between murder and literature? And how can we use the writings of killers to identify them, catch them, and stop them? 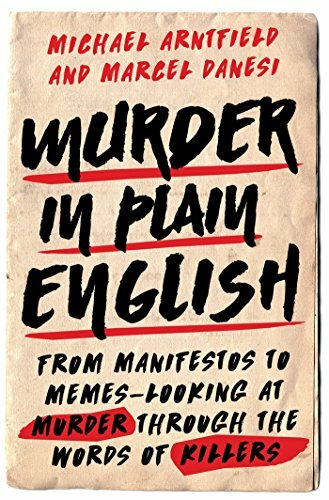 Murder in Plain English: From Manifestos to Memes—Looking at Murder through the Words of Killers, co-authored by Michael Arntfield, a professor of criminology at Western University and Marcel Danesi, a professor of anthropology at the University of Toronto, attempt to answer this unique and thought provoking question. Early on in the text the authors make an astounding statement that they believe “countless deranged killers . . . were failed writers of one kind or another,” and further state, “literary genius . . . is rather common. Mass murderers, terrorists, and serial killers alike, regardless of education or literary level, demonstrate a consistent narrative impulse to both document and rationalize their grisly crimes.” Although part of this statement is true, they never fully backed up the murderer as “literary genius” claim with any evidence. Murder in Plain English includes an extraordinary large and impressive collection of murderers and their foul deeds, both well-known and obscure. Be warned this is not a book for the faint of heart and is explicit in its descriptions. Unfortunately, the sheer number of stories, its rambling disjointed nature, and academic writing style makes for a difficult and often unpleasant read. While the books premise is extraordinarily unique, the author’s obvious bias and often forced inferences on the evidence, instead of reasoning from facts to conclusions leave the reader confused. Despite all the specifics, analysis, and provocative nature of the subject matter there is no greater understanding of the reasons why people commit murder. The mere statements of killers and madmen, whether in written confessions, letters, diary entries, manifestos, or memes cannot be considered literature and any attempt at connecting the two is a stretch beyond the point of reason. In the words of the authors themselves “This linkage between writing and murder has undergone very little expert scrutiny or analysis,” and to be honest there’s a reason for that.